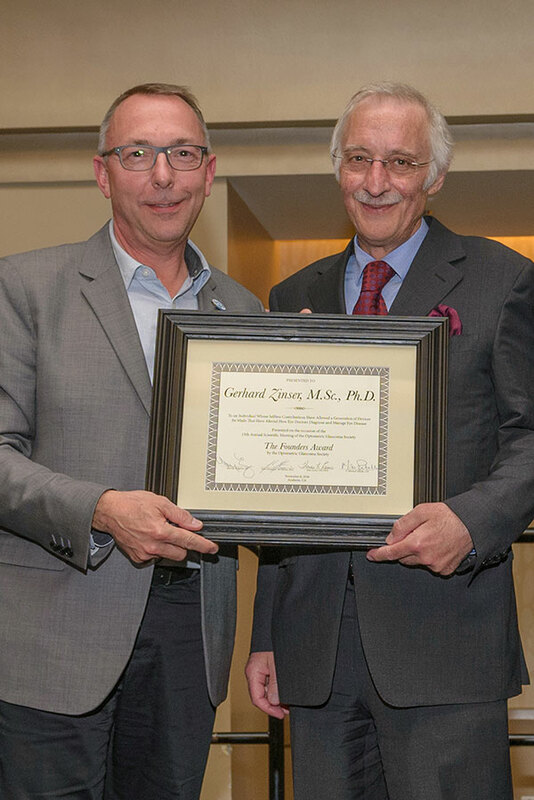 Dr. Gerhard Zinser (right) receives the Founders’ Award from Dr. John Flanagan, one of the founders of the Optometric Glaucoma Society. Heidelberg, Germany – Dr. Gerhard Zinser, co-founder and Managing Director of Heidelberg Engineering, is the first non-clinician to be honored with this prestigious award. Earlier this year he was also elected as part of The Ophthalmologist’s Power List of the top 100 most influential people in ophthalmology. The Founders’ Award was handed over by Dr. John Flanagan, one of the founders of the Optometric Glaucoma Society, during the society’s Annual Scientific Meeting in Anaheim, CA, on November 8th. In his laudatory speech, John Flanagan, OD, PhD, (Dean School of Optometry, UC Berkeley, CA) emphasized Dr. Zinser’s significant and long-standing contribution to diagnostic imaging in eye-care with innovative and reliable devices which have turned into household names for eye-care specialists worldwide. Dr. Flanagan summarized the achievements of Dr. Zinser and Heidelberg Engineering dating back to the launch of the first diagnostic imaging device geared towards glaucoma diagnostics in 1991, the Heidelberg Retina Tomograph (HRT). Dr. Flanagan reminded the audience also of the tremendous impact on eye-care of the most current contribution of Heidelberg Engineering, the multimodal SPECTRALIS imaging platform. “I am honored to receive this award and accept it in the name of the whole Heidelberg Engineering team”, said Dr. Gerhard Zinser. Since the establishing of the Optometric Glaucoma Society, the Founders’ Award has only been awarded to three clinician scientists, all of them glaucoma research luminaries: Douglas R. Anderson, MD (Bascom Palmer, Miami, FL) received the honor in 2011, Robert N. Weinreb, MD (Shiley Eye Institute, UC San Diego, CA) received the honor in 2012 and Harry A. Quigley, MD (Johns Hopkins, Baltimore, MD) in 2015. For the employees and distribution partners of Heidelberg Engineering, the recognition awarded to Dr. Zinser’s achievements is an encouragement to continue bringing innovative diagnostic devices and IT solutions to eye-care specialists around the world.